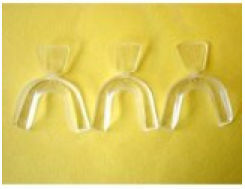 The reason thousands of people order dental lab teeth trays directly from labs is to save money. A friend recently came to me in shock: "My dentist wanted to charge me $500 for a night guard!" But if you order direct, online, or through the mail you can often buy them for half, a third, a quarter, and sometimes even less. But be careful, don't always go for the cheapest price. Which option you choose to purchase should be guided by WHY you need or want teeth trays. Or a custom-made sports mouthguard at places like Amazon.com. #6 - Make final adjustments so the tray fits more comfortably in your mouth, if needed. Pretty much each step is the same no matter what kind of teeth tray you order (i.e. 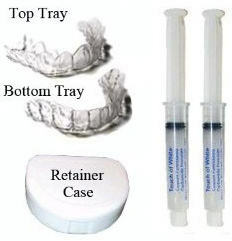 clear retainer, whitening tray, etc.). "Wait for the lab to process and make your custom dental tray…"
Each type of tray, for the most part, uses a different material. Thinner, thicker, or stiffer type of tray, for instance. And it's guided primarily by what you're buying; a night guard, sport mouth guard, etc. You just have to make sure you send them a good impression of your teeth. The lab cannot do anything without that. This is where a lot of the cost savings come in. You're going to do the dentist's or dental staff's job of taking a good impression. This takes some practice, but not difficult. A lot of the cost savings also come in on Step #6. If you use a dentist, you'll return to the office to pick up your teeth tray and he, or his staff, will make any adjustments needed so it fits comfortably. But in this case, you make these simple adjustments and pocket the savings. It's not too difficult to do since most of the materials can be adjusted or trimmed with a good pair of scissors. However, if you run into problems or aren't sure, you can call the lab for pointers. One of the keys here is the more accurate the impression, the more accurate the dental tray, and the less need for adjustments or trimming. Again, it's not difficult to do, as thousands do it on their own every year. Plus, this is where you stand to save money. This could be a good option if you're looking for a whitening or bleaching tray, a night guard, a clear retainer, or even a sports mouth guard. Once you get a set of teeth trays you should take care of them, it's an investment into your oral health. When you remove them from your mouth get into the habit of washing them and brushing them from the inside. You want to remove any build-up and yuckiness. If you don't, they'll look disgusting and start to smell disgusting, too. After a while you'll notice that no amount of brushing really gets them clean-clean. And you'll be right. The best way to keep them clean at this point is by dipping them into an ultrasonic bath. Don't worry, it's not as scary as it sounds. At my lab we use these machines because it's a fantastic way to clean out the nook and crannies. However, you don't need an industrial-grade machine like ours, you can easily buy an inexpensive ultrasonic bath for home use, like the one pictured above. Ultrasonic cleaning is really the best and only way to clean out all the corners and crevices found in your teeth tray. Besides, you'll enjoy using yours to clean other small and valuable items around your home, like jewelry, eye glasses, and dentures. A Cheaper Option Than Custom Made Through a Dental Lab? Home teeth whitening is probably the number one reason people buy teeth trays online or by mail. But it's not my favorite, and it usually has poorer customer satisfaction overall. I mention it because it's out there and I want you to know the drawbacks. I'm talking about thermo-forming teeth trays. You may also find them sold with different names like boil and bite mouth trays. When it cools down and hardens, it should take your teeth's shape. An extra tip on thermo-fitting teeth trays. Instead of boiling the water to soften the plastic, get the water to just under boiling temperature. When you see just a few tiny bubbles starting to form... dip the trays in to start softening them and follow the rest of the instructions above. Because these type of trays are known to soften too much, too fast, and basically turn into a melted mess. Wasting your money and your time. They don't fit accurately and I find them uncomfortable. Also, if you use them for teeth bleaching, they're not snug enough. They leave too many empty spots between your teeth and the tray. To try and fix this, many people dab on a lot more gel hoping to fill in the gaps. But this is a horrible solution because it wastes gel, creates unpredictable results, and the excess gel can cause more tooth and gum sensitivity. But some people are happy with this option. I believe you're better off with a custom-made, dental lab processed teeth tray (either direct or through your dentist). Your teeth are worth it, and you'll enjoy saving big by buying direct. 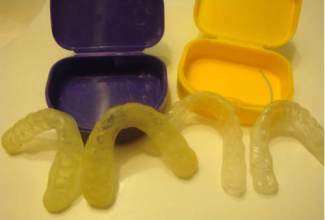 You can order teeth trays direct from some dental labs online and save a lot of money. Thousands of people do this every year and are satisfied with the results and savings. You can find lab processed teeth trays on reputable places like Amazon.com. 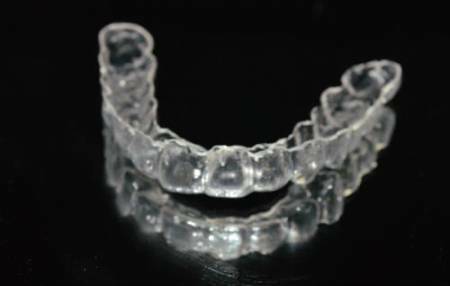 You can get teeth trays like Night Guards, Whitening Trays, Clear Retainers, and custom-made Sport Mouthguards.